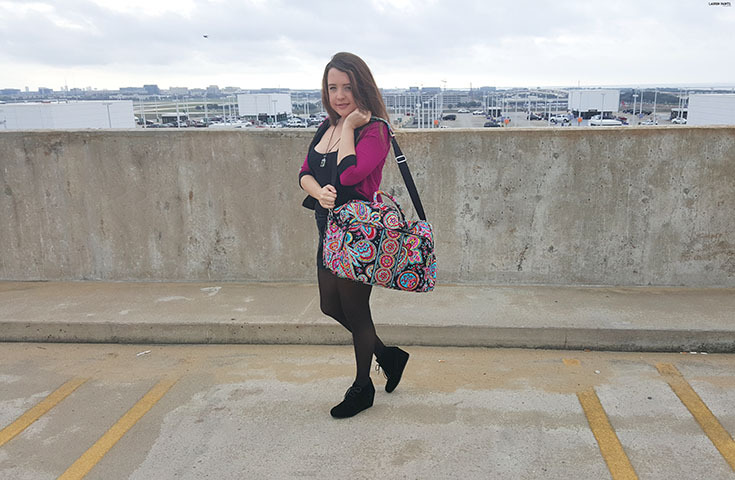 This post is brought to you by Vera Bradley and Her Campus Media. Going home to see family is something I look forward to all year long, it's just one of those things that will never get old. With copious amounts of homework and a pending due date always on the horizon each and every week, I'm so glad to be taking a break and walking away from it all for a little bit. 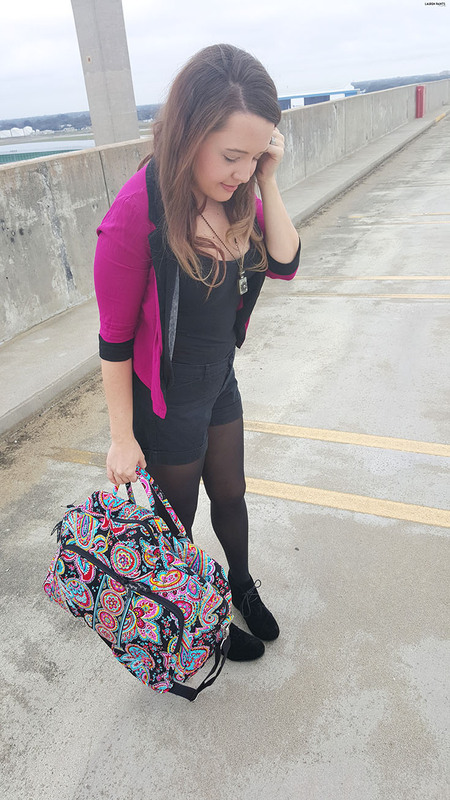 I'm also super excited about my new Vera Bradley bag. 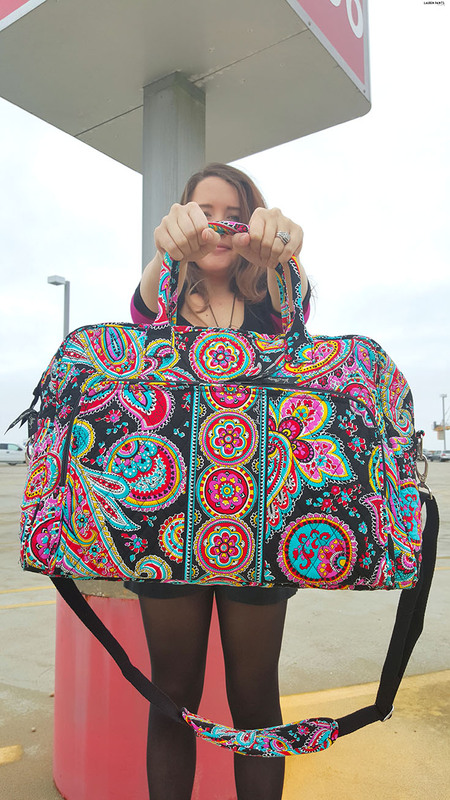 It's the weekender bag in Parisian Paisley and it's so roomy and perfect for a little hop to the Midwest! 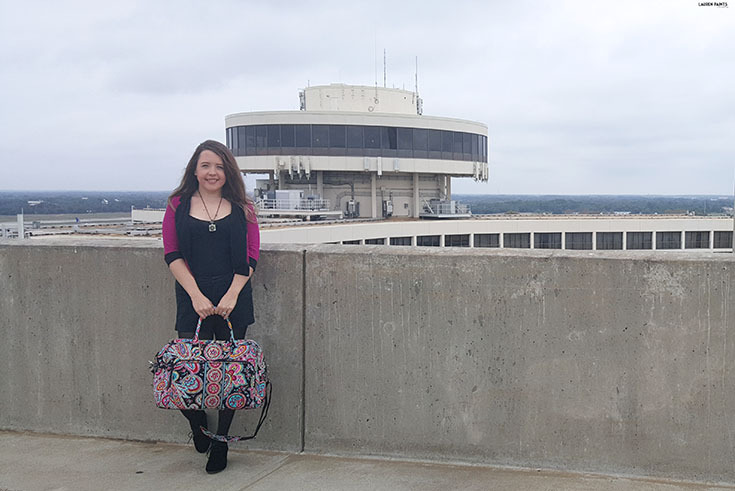 I packed a handful of winter clothing, a couple pairs of leggings and boots, as well as my whole kit and caboodle of travel essentials and my Vera Bradley bag still has room to spare for presents as well... because we all know it's fun to go home and get spoiled! Speaking of being spoiled, as I mentioned, I have a whole kit and caboodle of stuff I need to bring with me on all trips... I wouldn't say I'm high-maintenance, but I do like to have a little bit of everything important while I'm away from home. My Kindle Fire so I can read and entertain myself during layovers or long hauls on the road... I'm totally guilty of getting lost in a book on a vacation and I love every single second of it. My next must have is obvious - chapstick. Whether you're going somewhere sunny and need a little protection from a sunburn or your heading somewhere cold and need to soothe your chilled chapped lips, this is a necessity for everyday life really. Another technology related must-have for all road trips - headphones! Not everyone wants to hear Drake busting out of your cell phone nor do they want the play-by-play from the episode of Teen Mom you're watching on Hulu. Go ahead and plug in a nice pair of COMFORTABLE headphones. Try on a few pairs and find what works best for you! 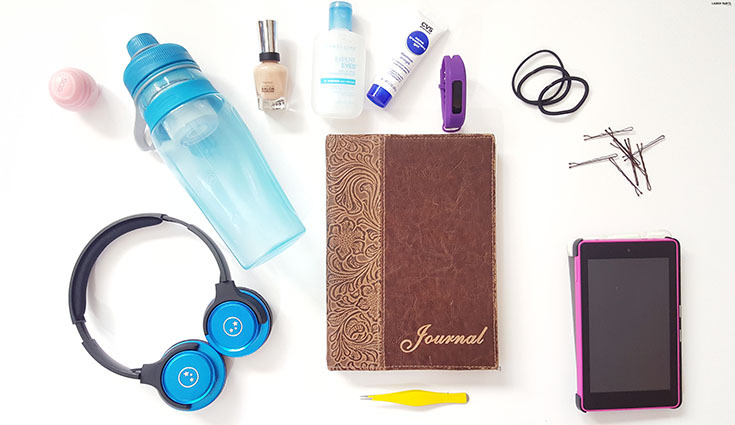 You'll probably also want to pack a journal with you, at least I always want one with me. As a creative person, you never know when a good idea will strike - you don't always have access to technology because those silly devices die, but usually a pencil (or pen, most of the time) is pretty reliable. Plus, if you see someone famous you can ask for their autograph... because who doesn't love fangirl-ing in the middle of an airport or hotel lobby? 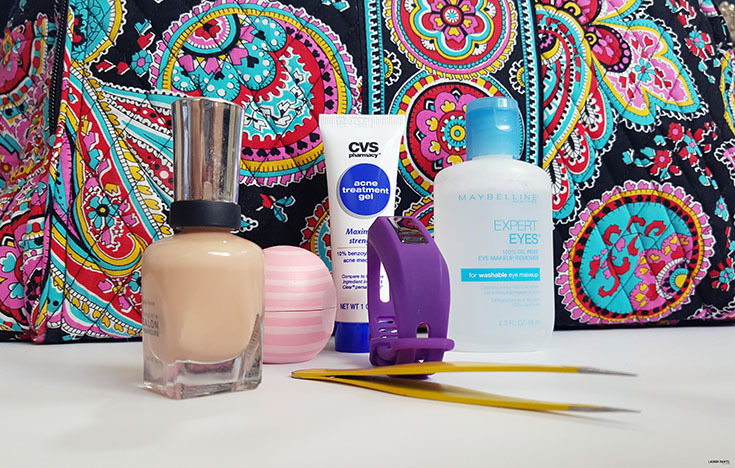 This next item may surprise you but nail polish is on my must-have list! Whether I need to touch up my toes or freshen up my mani, I like to know I'll have the shade I'm wearing within hands reach... No one likes feeling ratchet on vacation and bringing your current nail color is a great way to avoid that. Speaking of looking ratchet, I always bring at least 3 hair ties and a handful of bobby pins with me because my hair is naturally curly and in the right climate, no matter what I do, it's going to show off it's au-naturale look. While I love rocking my curls, sometimes... It's nice to be able to pull my hair out of my face and frankly, being stuck without a hair tie just isn't fun. Something else I bring with me just in case is my travel water bottle with a built in filter. I refuse to pay airport prices for water, plus I never know how badly jetlag will hit so I make sure I always bring my travel water bottle with me and then fill it once I get to the airport! Another lifesaver while on vacation is eye makeup remover. Whether I'm attending a wedding or just spending time with family - most likely I'm going to shed a tear or two, although it'll be from laughing too hard... With that said, I don't want mascara and eyeliner smears all over my face so I make sure I always have a stash of my favorite way to remove it all. On the same page as eye make up remover, I also bring an acne treatment cream with me, just in case my skin decides it wants to work against me. After using a facial cleanser, I apply a dot of a treatment before bed and I typically can wake up without a blemish! While we're on the topic of beauty products, another thing I'm constantly having to combat are my eyebrows, so I always, always, always bring a pair of tweezers with me on a trip. You never know when you'll find that one stray hair throwing off your look so having tweezers while traveling are a must! The last item I always make sure I bring is something that helps me stay fit. I know that my activity tracker and it's charger are two things that always accompany me while I'm on the go... I love being able to know how much I walk while I'm sight-seeing and finding out my calories burned for the day let's me know how much I can indulge in my favorite foods back home. As I said, I don't think I'm too high maintenance... I just know what I like and/or want and I'm sure to bring it with me! 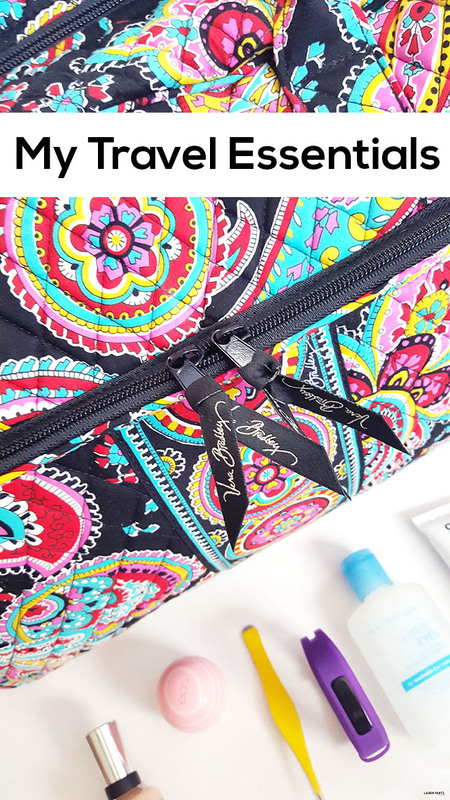 Luckily, my Vera Bradley bag easily holds all of this AND my clothes! So tell me, what do you have to bring with you on vacations? 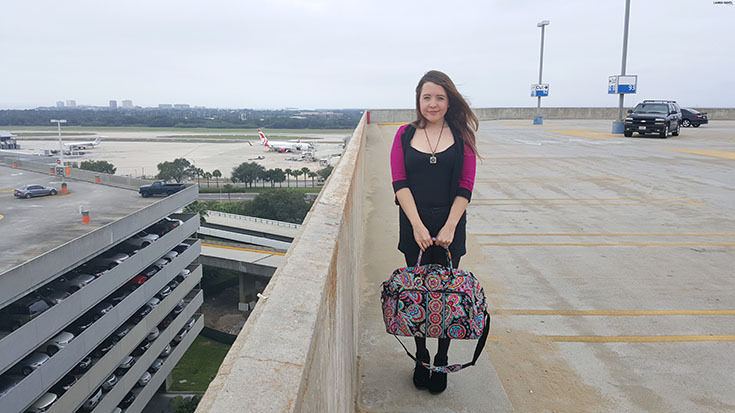 Do you have any travel essentials that you literally can't travel comfortably without? 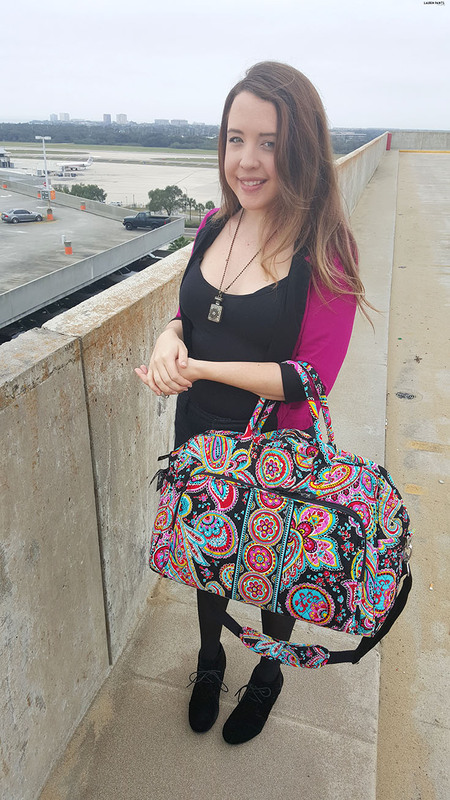 Tell me all about your favorite items to bring with you adventures in the comments below!